A NEW look Henley Bulls side fell to a late defeat against Bury in their first game of the season. There were several debuts for Henley in this Division 2 clash which saw Bury start strongest and after five minutes they took the lead. But this seemed to wake the Bulls up as they then dominated the possession and played the game in the Bury half. 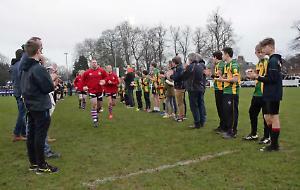 The hosts had the height advantage in the line-out but Henley were able to beat them for speed and captain Scotty White and Adam Neal did well in allowing the driving maul, which allowed Andrew Stobbs to crash over with Roddy Giles adding the extras. Bury then came back on the attack and a great interception by Tom Payne who made 40m before a great scramble tackle. Henley were looking sharp in attack but it was at the breakdown that was costing the Bulls turnovers, allowing Bury to build phases and get back into the 22 just before half-time. With the Bulls on the back foot, Henley’s defence stood strong with two huge tackles from Harry Jackson. But the pressure eventually told with Bury in front 12-7. After the restart, the Bulls took the game to Bury, and a quick pick from base of the ruck by Archie Van Dijk allowed their back line to give Ryan O’Neill space to step and sprint in from 30m. Bury were capitalising on mistakes from the Bulls to score but the Bulls hit back with Neal crashing over to make it 21-19 with 15 minutes to play. With five minutes to go, young Finn Pietersen brought a penalty in front of the posts 45 meters out which Giles slotted home. Bury were then camped on the Henley line and they scored with the last play of the game, which was converted to claim victory.